Editor’s note: Shortly after this story was published online, a federal judge dismissed the complaint against Earl Ehrhart and Neil Warren, but not Sam Olens and other defendants. A lawyer for Tommia Dean did not immediately have a comment. Among the roughly 6,000 fans who gathered at Fifth Third Bank Stadium for the second home game of Kennesaw State University’s 2017 football season was Neil Warren, whose day job is sheriff of Cobb County. Sheriff Warren’s reputation as a no-nonsense, west Cobb Republican who is hard on crime and undocumented immigration earned him a national profile and kudos from Fox News. Warren considers himself a patriot, pro-flag, and pro-military. What he saw in the minutes leading up to the KSU Owls’ 3:30 p.m. kickoff made him furious. About a week and a half before the game, five of the KSU cheerleaders, all black, had decided via group text to kneel when the national anthem played, much the same way San Francisco 49ers quarterback Colin Kaepernick did in 2016. Sophomore Tommia Dean had consulted her mother and her uncle, who was in the military and who supported her choice. For Dean, the protest was about police officers not being held accountable for unjustified killings. She has a brother, and she pictures him every time she sees the family members of another young black man killed in the news. “I thought of myself in their shoes,” she says. “I would want someone to stand up for me if that was my brother.” Dean was among the cheerleaders who kneeled. In the days following the game, according to a report by the Georgia Board of Regents, Warren called KSU President Samuel Olens—a former state attorney general and Cobb County chairman—and told Olens that the cheerleaders should not be allowed to kneel during the national anthem. Republican state representative Earl Ehrhart, famous at the time for his outsize influence over Georgia’s higher education budget and proclivity for political incorrectness (he once described a KSU art exhibit on AIDS as less artistic than “a fully loaded porta-potty”), also called Olens the same day, echoing Warren’s reaction that the silent protests must be stopped. That week, Olens met with two of KSU’s athletic directors, one of whom had also received a call from Ehrhart. The group agreed that, for the first time in the football program’s three-year history, the cheerleaders would be hidden away in the stadium tunnel for the anthem to “improve fan experience,” per the Board of Regents report. During the next home game, Dean was surprised when she realized the cheerleaders weren’t going to be on the field. Annoyed, Dean and the others took a knee in the tunnel. The cheerleaders who took a knee are sometimes called the Kennesaw Five. But court rulings over the past 30 years have often sided with school officials, and very little case law has established what defines protected or school-sponsored speech when on the college or university field. Frank LoMonte, the executive director of the University of Florida’s Brechner Center for Freedom of Information, says that’s largely because many athletes choose not to push the issue for fear of losing a scholarship, or because of the long time between filing and adjudication. “Even if you prevail against the college, your victory might be a hollow and practically meaningless one,” he says. A motion to dismiss Dean’s case filed by Ehrhart’s attorney, Jonathan Crumly, however, argues that the cheerleaders were not exercising private speech when they kneeled during the national anthem, but rather government speech; by wearing KSU uniforms and serving as cheerleaders, he argues, they were representatives of the school. The motion adds that there is no proof that Ehrhart, who did not attend the game, was even aware that Dean or the other cheerleaders were black. 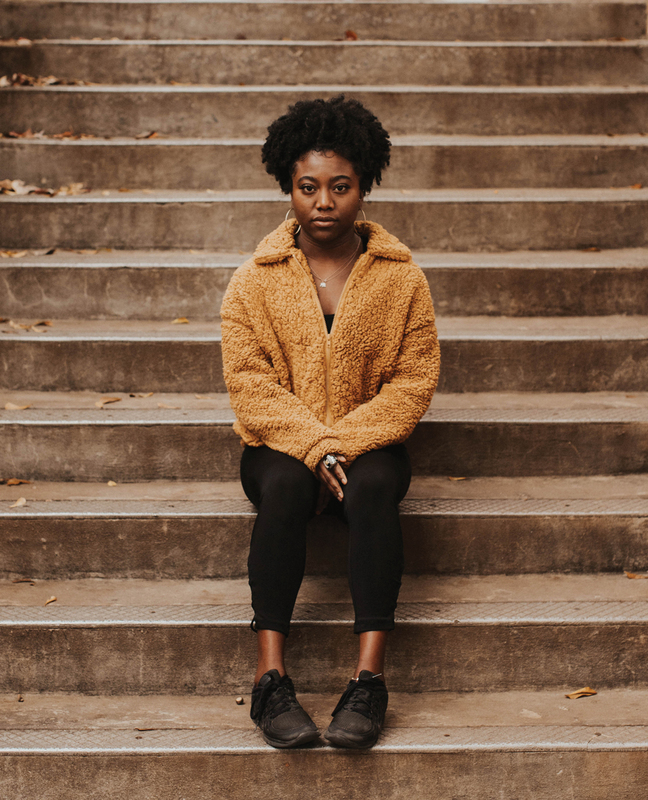 The motion omits the ironic fact that Ehrhart cosponsored a 2017 bill that prohibited a school from subjecting a student to disciplinary action based on his or her expressions or viewpoints, or reactions to them. 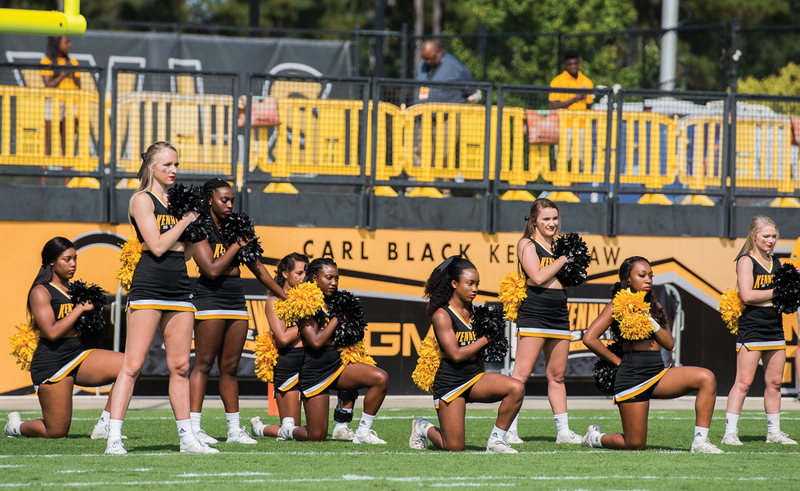 In the wake of student and community calls for Olens to step down from his $450,000-per-year position as KSU president, he did so in February 2018, but not before walking back his decision to allow the cheerleaders their silent protest. The cheerleaders returned to the field on November 11—Veteran’s Day—and locked arms. 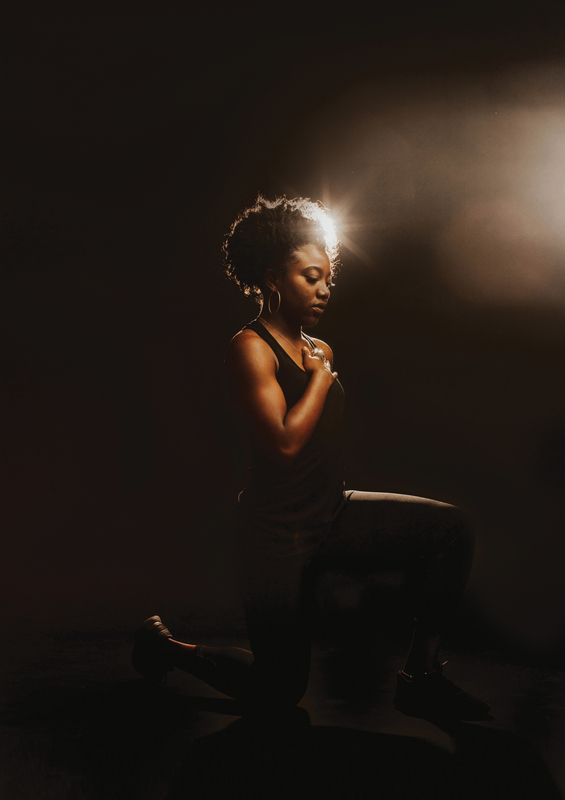 The following week, they kneeled again to boos from members of the crowd. This article appears in our February 2019 issue.